I was saddened to hear of the death of the great Benoit Mandelbrot today. Although this is a history blog, I am a scientist. My love of history comes from the same place as my love of science, both help us understand the way the world around us is. I don’t think anybody in the second half of the twentieth century did as much to explain the world as Benoit Mandelbrot. So what are fractals? It is short for fractional dimension, and the phrase was coined by Mandelbrot in 1975. They do rather defy the conventions of a formal definition, but you sort of know one when you see one once you have had your eyes opened by reading some of Mandelbrot’s work. For instance, a fern has a fractal structure. Each frond is similar, though not identical, in shape to the whole fern. This can be modeled mathematically by using a recursive equation, where the same element is run a number of times. Or something like that. Anyway, this is not a fern. It is the output of an equation which defines a process to be continued until a condition is met. It is sort of like a map in a way. This knowledge can be used to produce a whole range of realistic looking images that resemble the real world. Using the fractal approach for instance it is possible to produce really realistic looking clouds. When I read the Fractal Geometry of Nature in the early nineties it was a revelation. Suddenly lots of things that had never really been part of science were given a rigorous and very beautiful treatment. The shape of ferns. The way clouds look. How long is the coast of Britain. It is a strange book, in the sense of it being hard to know where you should put it. It isn’t really a maths book. It isn’t really a science book. I will admit it, it definitely isn’t a history book. It is the only book I have read where the illustrations are the most important single bit of the book. You don’t really read the Fractal Geometry of Nature. You hold it in front of your face and let the fractal view of the world diffuse into your brain by a sort of osmosis. 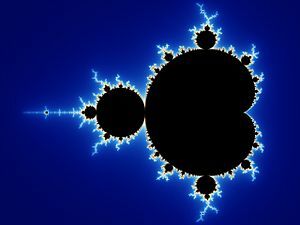 With the death of Mandelbrot the science of fractals moves into history as one of the leaps mankind has made in understanding the Universe we live in. We shall miss him. He was one of the few people who has really gazed deeper than the rest of us, and come back to illuminate our lives.